Nature Recorded on Silk and Mountain Range are an ongoing series of abstract fibre artworks featuring botanical monoprints. The organic evidence captured on silk documents the beauty, mystery, and healing properties of plant material. My work relates to Canadian nature in a very physical and literal way. I follow centuries-old techniques of dyeing fabric with natural dyes and combine them with the more contemporary method of contact-printing with leaves, stems, flowers, and roots. 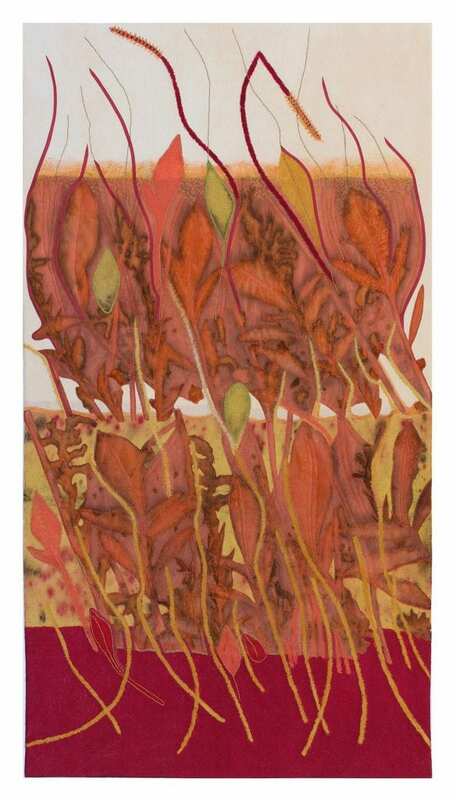 The process of unlocking pigments and tannins in the botanical material is as important to me as the graphic vocabulary that shapes my work. 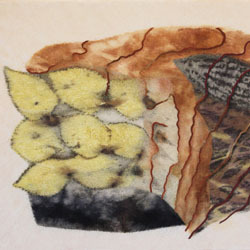 The monoprinted silk is then collaged, needle-felted into its final form, and detailed with hand-stitching and fused silk. In my creative process, I draw inspiration from books, Buddhist philosophy, and my daily contact with Ontario’s rural landscape.